A complete list of survivors was not immediately provided. Mr. McCain and Senator John Kerry, a Democrat and fellow Vietnam War veteran, were chairmen of the Select Committee on P.O.W./M.I.A. Affairs, which found “no compelling evidence” that Americans were still alive in captivity in Southeast Asia. Veterans groups and families of long-missing troops rejected the report. He also pressed for full diplomatic relations with Vietnam, which were achieved in 1995. In the 1996 election, Mr. McCain appeared to be a favorite for the Republican vice-presidential slot, but former Senator Bob Dole, the Republican presidential nominee, chose Jack Kemp, the former congressman and National Football League star. They would lose to Mr. Clinton and Al Gore. In 1993, Mr. McCain gave the commencement address at Annapolis: the sorcerer’s apprentice, class of 1954, home to inspire the midshipmen. He spoke of Navy aviators hurled from the decks of pitching aircraft carriers, of Navy gunners blazing into the silhouettes of onrushing kamikazes, of trapped Marines battling overwhelming Chinese hordes in a breakout from the Chosin Reservoir in North Korea. Syria, Iraq, Russia, North Korea, and nine other nations the Arizona senator has been eager to bomb, invade, or destabilize. Even before he was caught playing poker on his iPhone at a Senate hearing on Wednesday, Sen. John McCain (R-Ariz.) had already sent a message: Anything less than an extensive aerial assault on the Syrian regime by American forces would be an unacceptable approach to the conflict in the Middle East. This was hardly surprising. Over the last two decades, McCain has rarely missed an opportunity to call for the escalation of an international conflict. Since the mid-1990s, he’s pushed for regime change in more than a half-dozen countries—occasionally with disastrous consequences. 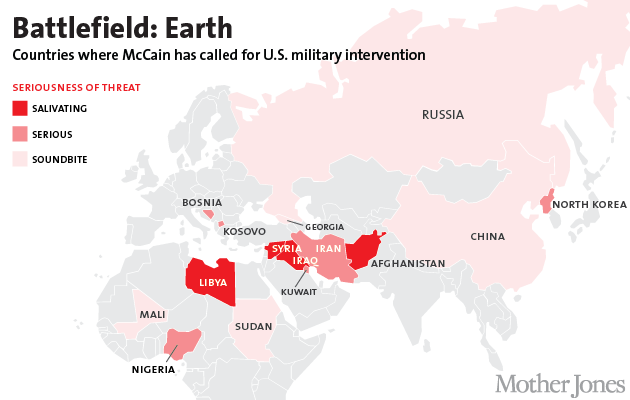 Here’s a quick review of McCain’s eagerness for military action and foreign entanglements. What he wanted: Airstrikes, culminating in regime change. What was it good for? TBD. What he wanted: Ground war culminating in regime change. What was it good for? See above. What he wanted: Osama bin Laden’s head, at any cost. What was it good for? Ground war culminating in regime change (ongoing). Fighting words: “I would arm, train, equip, both from without and from within, forces that would eventually overthrow the governments and install free and democratically-elected governments” (2000). “t does take time, as it did during the period of the Russian occupation of Afghanistan. But we were able to provide them with some weapons and wherewithal to cause the Russians to leave Afghanistan. So we can do it” (2012). What he wanted: Regime change. What was it good for? Regime change (12 years—and one ill-considered tweet) later. What was it good for? Airstrikes. What he wanted: Ground war in Kuwait. What he wanted: Special ops raid against Boko Haram. What he wanted: Air strikes and military assistance. What he wanted: Either regime change by aiding local opposition, or an outright military confrontation. What was it good for? Unspecified air strikes; unspecified support for dissident groups. What he wanted: Unspecified aggression toward Russia after invasion of Georgia. What was it good for? Absolutely nothing. What he wanted: A new Cold War. What he wanted: UN troops. What was it good for? UN troops. What he wanted: Military assistance. What was it good for? Military assistance. What he wanted: Totally unclear. What was it good for? Nothing.